The much-anticipated collaboration with the ex-Cocteau Twins guitarist saw release in May 2009. Beautiful in places, slow and tiresome in others, Mirrorball plods along with typical and rather familiar sounding Robin Guthrie guitar melodies and an older sounding Foxx chanting his improvised Cathedral Oceans style vocals. If you've heard any Cocteau Twins album or Foxx's Cathedral Oceans work, you'll have a pretty good idea how this album sounds, as a clear fusion of the two. 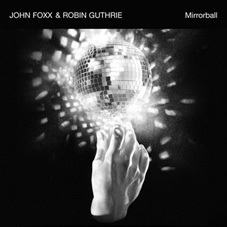 Received well by critics all round, there's no denying the musical excellence of Mirrorball, although fans of John Foxx's more electronic work may be leaft yearning for something more. Had some of the songs actually had lyrics – something extra to draw you in, this album could be much more engaging, but ultimately, I personally found Mirrorball to be uninspired and unadventurous, despite it's best attempts to seduce me with it's warm and melodic ambience – although I'm sure on some quiet, warm summer evening, this album will eventually fall perfectly into place.